Friendship bracelets are made with just two knots: the right and the left knot. By combining these two and using all kinds of colors and nice patterns, you will get great results. 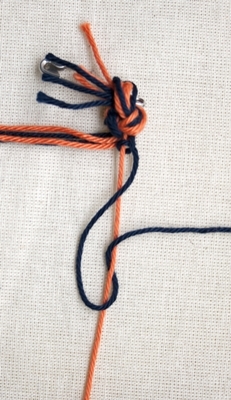 The right knot is made by knotting two threads together as follows. 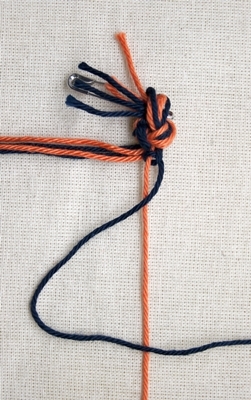 Keep the right thread (orange) taut with your left hand and knot the left thread (the working thread, blue) around it with your right hand by putting it from left to right over the right (orange) thread. 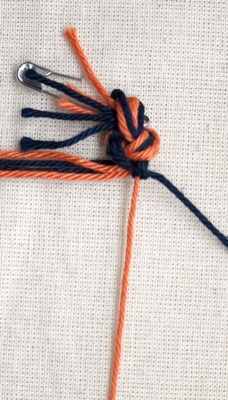 Short explanation with this picture: it looks like the blue thread is right of the orange thread (see at the top right below the large knot with all the threads). When you’re just starting, the threads do not have their own spot. So, if that helps you, give a little tuck on the blue thread so this is really laying left, but in this stage it is not really of big importance. When the knot is finished, de position of the threads become ‘settled’. 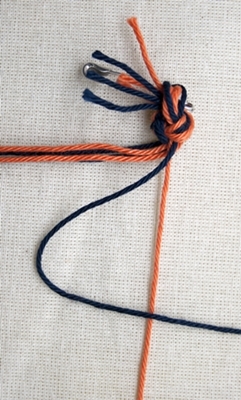 Bring the right thread (blue) to the left again underneath the left thread (orange) and bring it to the right again on top of the orange thread. Pull the knot tight. In the picture on the left it is not completely pulled tight to show you what the meaning is and how it looks. The first part of the double right knot is now finished. Repeat this again to make a double right knot. Still keep the right thread (orange) taut with your left hand and knot the left thread (blue) around it with your right hand by putting it again from left to right over the right (orange) thread. Again bring the right thread (blue) to the left underneath the left thread (orange) and bring it to the right again on top of the orange thread. And pull this second knot tight too. 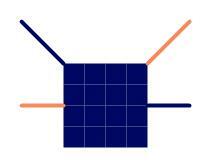 In the picture you see a blue knot that’s on the orange thread. 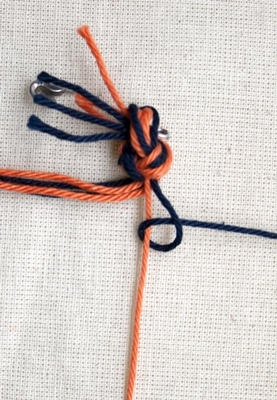 You have now made 2 knots around the orange thread, and the blue thread comes out of it on the right and the orange thread is on the left of it. In the patterns this double right knot is shown as follows. 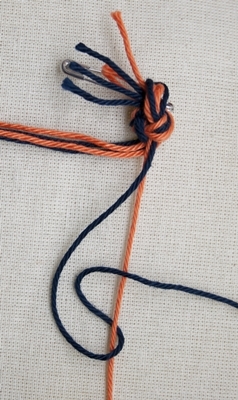 You can see quite clearly here that when we have to make a double right knot, that the blue thread is the left thread and that it is the one that is knotted around the orange right thread. The orange thread is the thread that will be held taut and the blue thread is the knotting thread. Also becomes clear that the orange thread comes out on the left and the blue thread on the right after making the knot. The knot itself shows as a blue knot.